Diving into yoga on all levels has been a major part of my life for 14 years. I have explored various yoga philosophies, schools of thought, and styles of yoga, how yoga helps with stress and dis-ease, various meditation techniques, pranayama techniques, cleanses, Ayurveda, anatomy, therapeutics, and more. I enjoy going deep into the information even if it is just a repeat as it helps my brain make sense of some of it. Some of it I read and I have no idea what it’s about but I am still interested. I didn’t understand when I started yoga how much other stuff came with the practice, so much more than a downward dog pose. After all these years I am only more intrigued. I intent to go to India to study but not yet and not with just anyone it will be an opportunity to immerse into yoga at it’s roots. I have no interest in doing a tourist trip or attending an ashram that caters to Westerners’ s flocking over for yoga teacher training immersions, just not my thing. I do want to understand more about the Hindu culture and how various ritual practices are tied to yoga. I have little experience with this side of yoga but of the few traditional rituals I have attended I am more than a little intrigued to know more. Each one of us practice daily rituals but one of the major differences is that most of us are doing them with no mindful fullness at all, with no gratitude or connection to something more, it’s just daily, necessary body maintenance. Recently, I wrapped up my 7th Yoga Teacher Training and sometimes there are just these moments that stick out from the other moments that really change how you see things or how you understand things. This one moment where a slight change of words, changes the meaning. My understanding of Advaita Vedanta is that there is only one reality that we work with and everything else falls into the realm of illusion or maya. This means that the only thing that is truly real is spirit and that everything else is “unreal,” a misunderstanding, and illusion and that our goal in life is to figure that out and to come back to this understanding. When we don’t get it we will suffer and the way out of the suffering is through remembering this, only Spirit is real and anything that changes and is matter, is a figment of the mind. I have never been able to understand this, at the moment I am sitting on an airplane, bumping along through the air at high speeds, typing these words on my computer with a plane full of other people. The idea that the plane is an illusion doesn’t jive with me. The idea that I am not my body, while I sit here and can feel every toe, finger, joint, muscle and I’m using my brain and senses , don’t resonate with truth to me. The idea that I am not my emotions, seems far fetched since I can feel a whole bunch of them right now in this very moment and since waking up I’ve likely touched on at least 100 or more different emotions. To tell me they are not real makes no sense and I question the validity of teaching people they are not their bodies, their thoughts, their emotions. During the training this slight shift of wording hit me like a bomb and opened me up to a new and beautiful understanding of all of this. In yoga class, I have heard teachers say these very phrases “You are not your body, you are not your emotions, you are not your thoughts” but if we change this a little bit all of the sudden my heart lights up as if it was plugged into a powerful source of truth. What if we are MORE than our bodies, MORE than our thoughts, MORE than our emotions? What if we are MORE than we ever thought we were? Perhaps some people that study in the Vedanta lineages of yoga have already come to that understanding and even mean that when they repeat or teach “I am not my body,” especially when it is sore , tight, falling apart, broken, failing but I haven’t heard a teacher imply that I am more than that but that it’s a flaw in my awareness, that I am only spirit and nothing more. How liberating to know that you are more than just this aging body, the negative thoughts, the feelings of guilt, shame, sadness, anger, fear. I am in love with this new understanding that I truly felt I was gifted to know, by a shakitpat like experience, as if the universe hit me in the head but what if it was this way, does that help? It brings me more peace and joy to see it in this light. There is so much to be said about immersing yourself in yoga for 5 days at a time, to meditate with a group of people everyday, to breath together, to feel together, to laugh together, to grow together, to support each other as we expand our awareness of our own bodies or come to terms with injuries, chronic pain, people that have lost a child or a friend or a partner, people that are looking for community and connection in a time when it feels like any progress on the path of light was abolished with the recent election in the US. 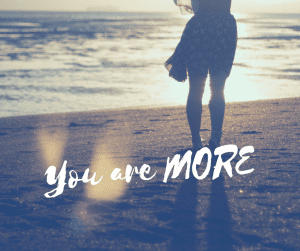 Now I am filled with the idea that we are all MORE, we are more than we every thought we were and we get to use that information for our own awakening so that it helps each day for us to connect to MORE, even through the most simple, mundane rituals we all have. That we make each day rich with this understanding of being more and that we can use all of our experience to feel and experience the full spectrum that life has to offer us every day rather than sleep our way through life or feel that everything that is matter is an illusion of your mind (although at times that is also true, and valid, and important but not always).